Really enjoyed being so close to canal park. Great for just walking around and enjoying the area. Parking was easy being able to park in the back lot of the hotel. Maybe something you would want to add to the parking on the sheet you send out. It is okay to park in the yellow lines in back lot. Red Lobster has the white lines. Per the hotel. The house was amazing! The interior has been redone with wood floors and nice furniture. The beds were very comfortable with Tempurpedic-like mattresses. The deck is big and there is a great view from the house and deck. It's only 1/2 hour from Duluth and very close to Gooseberry Falls and Tettegouche State Park. We are going to make a point of coming back to this place. We absolutely loved it! We also loved being near the Silver Creek Cliff tunnel and being able to walk the bike trail right next to it. We used to go to the Cliff 'N Shore Resort and like the area. 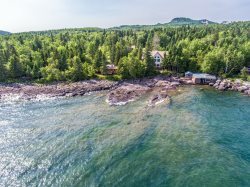 This was our second stay at Illahee and we love being so close to Grand Marais. The home has a beautiful setting on the lake. We really love having a wood burning fireplace inside and the fire pit outside. The kitchen is well equiped and the beds are oh so comfortable. My least favorite thing about Illahee is the spiral staircase which can be a challenge. The check in and check out process was efficient. I love the cabin...love being able to walk everywhere.